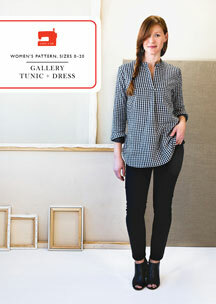 Share your photos on Instagram with the hashtags #gallerytunic and #lieslandco. This style is provided as a digital pattern. It may be printed on both home printers (using either 8 1/2" x 11" or A4 paper) and at service bureaus that handle 36" wide or A0 sheets. When you complete your order, you will be provided with a unique code to instantly download the pattern. See our digital product policy for full details. Suitable for drapey or lightweight woven fabric such as sateen, double gauze, shirting, voile, lawn, rayon, and silk. 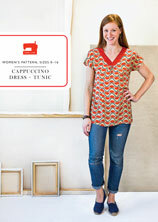 Tunic: Coordinating thread and featherweight fusible interfacing. Dress: Coordinating thread, featherweight fusible interfacing, and four 3/8" or 1/2" buttons for sleeve cuff. Chest 38" 39" 40" 41" 42" 43"
View A Length* 29 3/4" 30" 30 1/4" 30 1/2" 30 3/4" 31"
View B Length* 38 3/4" 39" 39 1/4" 39 1/2" 39 3/4" 40"
Chest 44 1/2" 46" 47 1/2" 49 1/2" 51 1/2"
View A Length* 31 1/4" 31 1/2" 31 3/4" 32" 32 1/4"
View B Length* 40 1/4" 40 1/2" 40 3/4" 41" 41 1/4"
* Measured from center back. 0 32 1/2" 25" 27" 35"
2 33 1/2" 26" 28" 36"
4 34 1/2" 27" 29" 37"
6 35 1/2" 28" 30" 38"
8 36 1/2" 29" 31" 39"
10 37 1/2" 30" 32" 40"
12 39" 31 1/2" 33 1/2" 41 1/2"
14 40 1/2" 33" 35" 43"
16 42" 34 1/2" 36 1/2" 44 1/2"
18 44" 36 1/2" 38 1/2" 46 1/2"
20 46" 38 1/2" 40 1/2" 48 1/2"
Great, but watch out if you do a FBA! If you want to make a FBA to this pattern, bear in mind that the front pattern piece doesn’t have the centre front line marked, and that this is in a different place to the fold line (ie the edge of the pattern). Before marking your apex for FBA, draw centre front onto pattern piece about an inch in from the fold line; then hold centre front line to centre of your body. If you don’t do this step, then your darts points will end up too close together once you have put the front pleat in. I chose this pattern in part because the cut matches a favorite ready-to-wear blouse. I wanted some light, fresh summer dresses with a cut that was flattering--this fit the bill. I've sewn it twice, and I get compliments each time I wear the dresses. The first one I made in a textured chambray. I sewed the longer sleeves, with a collar. The pockets, under collar, and placket were cut from Liberty cotton for a peek of color. I loved how smoothly the placket came together and the fit overall, so I grabbed a different textured chambray and a different Liberty half-yard and went to work. The second dress has the band collar and short raglan sleeves (just extend the shoulder edge by a few inches and omit the sleeves). I also cut bigger pockets and raised them an inch and a half. I've just about worn out the pattern--time to print out a fresh copy and go buy some fall fabric! This pattern is an all-time favorite--simple, well-cut, versatile, and easy to sew. My first pop-over placket and I was a bit nervous. But the directions were spot-on and walked me through each step. It was so simple. A great fit and style. I made the tunic in double gauze and will definitely be making more. My new favorite shirt! I loved how easy this was to sew. I was nervous about the placket but it came out perfect. I made this for my grown daughter to wear to work and she is thrilled. I plan to make her at least one more. Oliver +S patterns are really nice with all the finish details that make a garment look professional. I would highly recommend them. This is the third pattern I have purchased and all are great. I'm experienced in sewing classic button-front shirts, but felt like trying something different. This pattern met my need for a fun and uncomplicated sewing experience. The directions are well-written and don't require any special knowledge of sewing techniques. I did have to watch a tutorial before doing the placket -for some reason I couldn't visualize it until I saw it done. Beginners, don't worry. It is actually super easy! 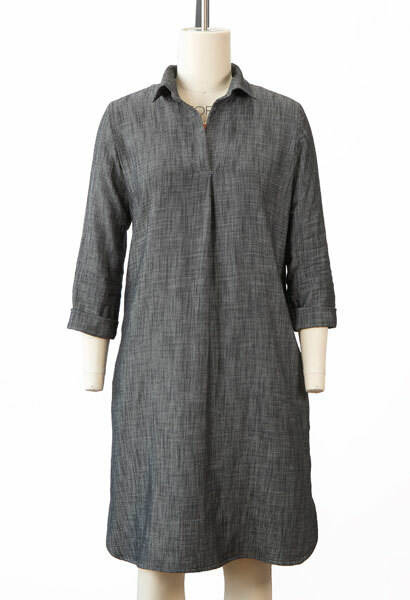 I made the tunic length in cotton lawn, with the shorter sleeve and collar band. Sewing it was fast, and the result looks very professional. My only problem was fit-related. The back and front armholes are symmetrical and so is the sleeve cap. This leads to the shirt pulling back at the neck and the top of the sleeve cap being in the wrong position for my arms. I will change this for next time. I usually need about two inches of difference in the armhole. Next time I will deepen the back armhole by 2" and adjust the back curve of the sleeve cap to match. This may not be a problem for everyone, but something to be aware of if you normally need a rounded back or forward shoulder adjustment. The rest of the shirt fit as expected,and will be nice and breezy for hot weather. 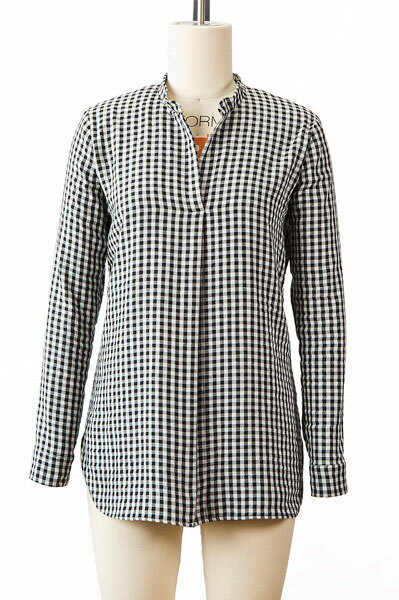 I recommend this as a good first shirt-making pattern for beginners, and a fun project for any sewist looking for a cute popover top. This is a wonderful pattern. The instructions are superb, especially the little “hints” strewn throughout. It is cleverly engineered so that the placket is a dream to install! The only part I didn’t like was the cuff area — the finishing of the space between the ends was awkward and difficult to make perfect. The sizing was off a bit for me — my first try was too big so I made the second one a size smaller and it’s perfect. This is a wonderful pattern for a very wearable garment. It is well written with many helpful suggestions for how to stitch various parts...placket, shoulders, cuffs. I made it first in muslin to test the fit before cutting into my Merchant & Mills linen. The fit is perfect. I made the dress first. It looked nice. I made the tunic next. IT IS AWESOME! I'm an experienced sewer, so I'm not sure if I actually followed all the directions (pay attention to the placket! ), but I'm VERY happy with the results. 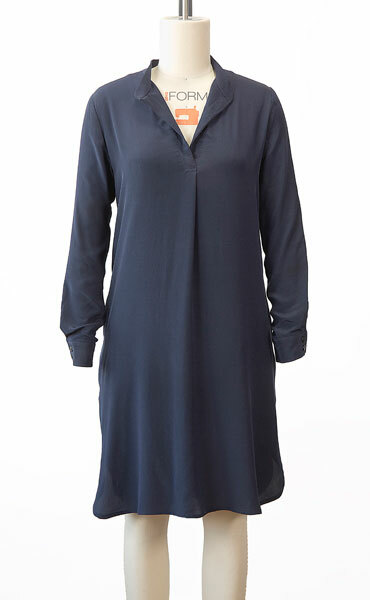 I bought the gallery tunic after having great success with the bottom up shirt for women. Sorry I forgot the name! The tunic turned out beautifully. I made one modification and added a gentle ruffle on the sleeve cuff since this seems to be the year of the sleeve! I love your patterns and they are giving me huge confidence as a returning sewist I've had loads of compliments on both tops and I'm proud to say I made it. I can't wait to try the other patterns I got. I bought this pattern on a whim at the checkout when purchasing the Everyday Skirt pattern, the whole "if you buy this now we'll discount it" gets me everytime. Guess what? I love it! I've already made it as a tunic top, great with my jeans for the weekend or 'dress down' day at work, and the longer version as a dress (with or without sleeves I've decided) will be lovely for work or casual wear. Instructions are great, true to size and easy to follow. Best bonus buy EVER!! I bought the gallery tunic and the instructions were clear and easy to follow. I made the cuffs differently from the instructions because they seemed too complicated (I just hemed the arm seam instead of cutting a slit). I would also recommend actually downloading the file as the web link disappeared in a week or so after I bought it - obvious, I know, but there was no indication in the email that it would happen. I do not have a copy of the pattern anymore. I have made 2 dresses and one tunic so far using this pattern. I have used chambray and rayon, both styles of collar, inserted the pockets and adjusted the pattern to include darts. The instructions are the best I have used for a clothing sewing pattern! The details like sewing a guide to fold the hem are so practical and helpful and mean that the finishes on each item are perfect. The best thing is that my new clothes look professionally made and I have received lots of compliments about them and enjoyed the awe when I casually say 'I made it'. I will be making more soon! Thank you for making such a great pattern -- this one has really increased my confidence level as a novice sewer. The fit and finishes are so nice, it looks like a higher-end store-buy. I made my first one in a gray shirting fabric, but the size I chose is a little snug around the bust and arms, so I'll go up a size for the next one -- which is laid out and ready to cut in a purple voile. I especially love the length, I'm 5'7" so I usually have to lengthen top patterns but this one is perfect. Only changes I made were 1) left out the pockets and 2) used my rolled hemmer foot on the hem (I thought the curves would cause problems, but they didn't, it came out very clean.) Thanks again & can't wait to buy more of your patterns. A very successful pattern. I read all the reviews and decided to make a size 14 instead of a 16. It fitted well, but when I make it again I will add a FBA which will improve the fit. I made the tunic and next time will make the dress. I've just begun to sew garments for myself and this is one of my favorite patterns! I have made 4 tunics so far: 1 out of flannel, 2 of voile, and 1 of rayon. I have made both kinds of collars and sleeves. My favorite combination is the cuffed sleeve and one piece collar. I have 2 more fabrics ready to cut for tunic #5 and 6! Very flattering garment! Loved this. Easy to follow instructions and a garment I really love. Will be making more of these for my me made summer wardrobe. I made the tunic version with long sleeves. The instructions were clear and the project was very enjoyable to sew. The only thing I didn't like was the shape of the mandarin collar--it sort of bumps up at the edges--but it's easy to change the shaping if you wish. The finished garment is quite roomy so I would go smaller if you're not sure which size to show. I've worn my wearable muslin several times already and can't wait to make another in a nicer fabric. This is a very well written pattern and the finished garment fits me perfectly!! I've already made two tunics - one in double gauze and the other in very lightweight cotton from India - and plan to make a million more. My new wardrobe staple. I love this pattern! This is my favorite pattern! I made a wearable muslin first to check whether I needed a full bust adjustment: I am a "C" cup by sewing fitting standards. But because of the loose ease of this style, I did not need it. I now wear that muslin as a pajama top. The pattern comes together very easily. The choice of two collar options is great and the other details like the pleat in front and back and curved hem really make this style something special. 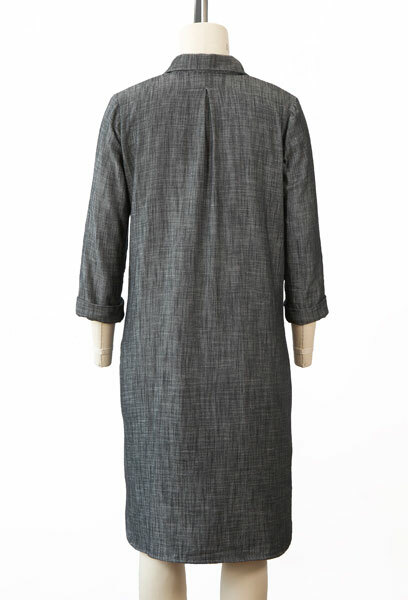 I made the tunic in Japanese double gauze and dress in lightweight denim. I will be making more because they are so lovely to sew and wear. It has been quite awhile since I have done any garment sewing. I think I complicated the process a little by going with mid-weight shirting cotton/poly blend; the fabric will NOT hold a crease so pressing was frustrating. I wanted to try the pattern before purchasing a more expensive double gauze. Despite my questionable choice of fabric my top turned out beautifully! It fits well and looks great on. I will definitely go ahead with the more expensive fabric now that I have my basic white tunic completed. The fit is spot on. The instructions were clear and the tips provided were very helpful. I look forward to trying other patterns for my granddaughter and I. Comment by Jimmy Chadwick on 08/15/2016. Lisa: Try a tailor's clapper on the poly-cotton blend. YouTube shows how. I have one sold by Angela Wolf (maple), and easily get a knife-edge press on poly-blend fabric. In the month since I downloaded this pattern I've made two summer dresses and a shirt. The instructions are excellent and I learned some good dressmaking tips from them. I can see myself constructing a whole wardrobe based around this design, varying the skirt and sleeve length and making a straight hem variation. Love this pattern! It is very versatile, easy to sew, and complimentary to so many fabrics and prints. Pattern is very well designed with excellent modifications. Very nice design. I've made other similar tunics that are difficult to get on and off over my head. This one has plenty of room without being oversized. Sleeves are comfortable, too. I used a big graphic print. The pattern is suitable to so many types of fabric. East to get a good result. Clear instructions, easy to follow. Sleeves easy to constuct and sit well. Recommended. Making the Gallery Tunic was, I kid you not, the most pleasurable sewing experience of my life. 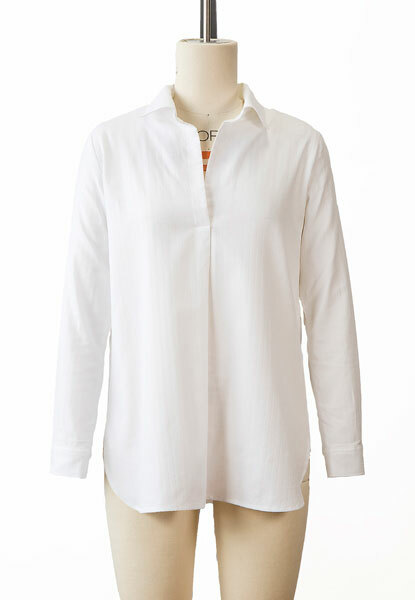 I think it came down to the instructions, which were so beautifully clear that things which I would normally find daunting (like the placket) came together "like buttah." The finished shirt looks not only as good as RTW, but as good as expensive RTW. Amazing! This pattern will definitely become a TNT for me. A fit note: I am 5'3", and long tunics aren't that flattering on me, so I shortened it by 4 inches (taken out at waist level). 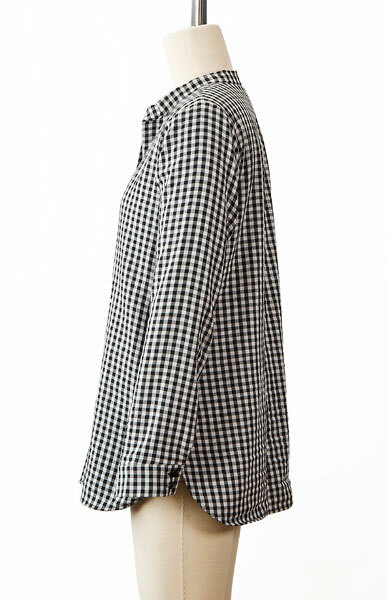 The front hem hits at low-hip level now, and looks great. Many thanks, Liesl! Lovely pattern, I have worn my gallery tunic several times already. The directions were very clear and helpful. Great fit, comfortable and flattering. Great fit, comfortable and flattering. Used a nice drapey rayon. I made it just as the pattern recommends with no custom changes. The fit was perfect first time out. I thought the placket would be the hardest part but turned out to be exceptionally easy. I can't wait to make many more, this time I will be more creative. Very "On Trend" pattern. The instructions were well written and easy to understand the fit was very good. The fabric I used was a paisley cotton lawn and it is so comfortable. I already have a cotton border print for my next Gallery Tunic. This will definitely be a TNT pattern for me! I just made my first tunic as part of the February, 2016 sew-along, and can't wait to sew a few more. The instructions, as always, are top notch. The tunic sews up beautifully without modifications, but is also an awesome starting point for adding your own personal touch with some modifications. I can see this pattern in my sewing rotation for a long time. 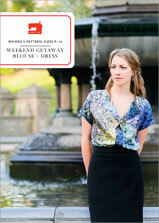 I recently made the Gallery Tunic as part of the sew-along on the blog. Though I have several Oliver + S patterns, this is the first of the Liesl & Co patterns I have tried. The directions are clear and helpful, as expected. The fit is great! 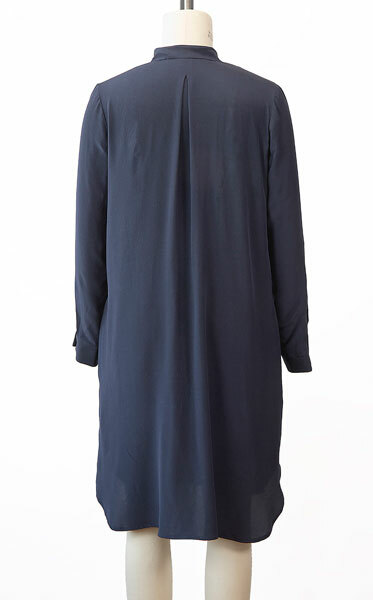 With a loose-fitting tunic, you could easily end up with a sloppy looking garment. This top has a nice fit in the shoulders and bust and contours in toward the waist and back out at the hips. The result is a really flattering fit and comfortable top. I love all of the different options. They make this pattern extremely versatile and definitely something you'll want to use more than once! 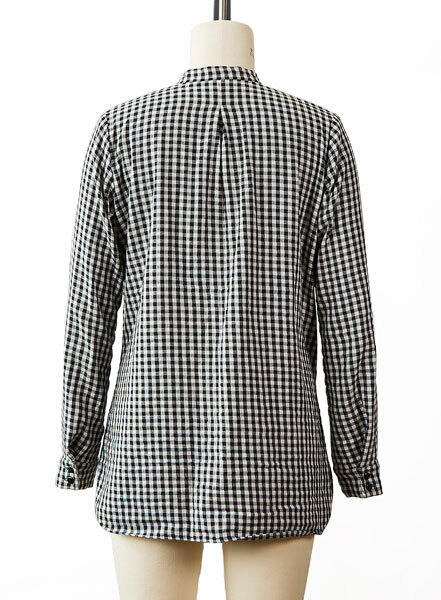 I made this tunic from a double gauze that's plaid on one side, check on the other. I cut the placket from the "wrong" side for flashes of the check, which also shows a bit on the inside of the lower back. This pattern went together beautifully and was amazingly forgiving of the slipperiness and instability of the gauze. The collar, as others have noted, is rather big, but in the soft gauze it lies nicely on my collarbones. I've started another one in voile, decreasing the collar by 3/4" and adding two fabric button loops to the placket. It's very pretty and elegant. I feel so elegant-hippie in this shirt! It's going to be a big favorite this summer. Made three blouses already. One in cotton/silk blend, one in poplin and one in lawn. It's a highly versatile pattern. In different fabrics they all look different. Planning one in brushed cotton (flannel) next. Don't consider it a tunic, but I'm 175 cm. Lengthened the sleeves, as almost always. The collar is to large I found all three times. I just shortened it along the already stitched line as a guide. Placket is easy peasy, great instructions. French seamed the shoulders. No need for an fba although having a (European) D cup. Hem is steeply curved, so ironed and glued first. 11 of 12 customers found this helpful. The collar on the Gallery tunic/dress is a half-inch wider and two inches longer than on my ready-to-wear shirts with a similar collar. I made the size 6, and I'm 5'2" tall. The width was easy to fix by folding the pattern piece, but I don't see any way to decrease the length. The collar is out of proportion for a petite person. The instructions are detailed and easy to follow. I loved using this pattern, and the resulting tunic shirt I made. I thought the collar with the built in collar stand was very clever. The instructions were really thorough, and I was able to make the pleated placket very easily. I would definitely use another Liesl + Co pattern after this. Made tunic out of shirting fabric. Great instructions. Nice pattern.I have fabric for second tunic! This pattern could have been made just for me! I made the tunic with some sueded rayon from my stash, and it drapes beautifully and is very flattering to my rectangle shaped body. The instructions are comprehensive, so much that they look kind of intimidating. But if you just go along one step at a time, it will lead you to a success. It's beautifully drafted and all the pieces go together perfectly. I found one error on the collar piece. One edge is marked Fold, but the fold should actually be on the opposite side of the piece. Thanks for the review Debbie. The error you mentioned was indeed found on the first printing. An errata notice for it can be found here. I love this pattern! 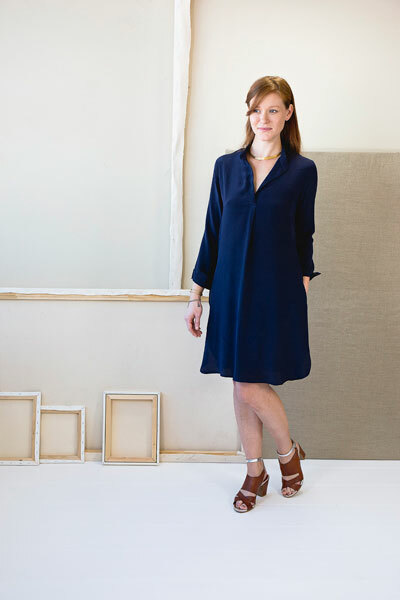 I made the dress length in a soft chambray fabric, no collar and with the turned back cuffs. What a workhorse this is in my wardrobe! With a belt I'm currently wearing it with white jeans a LOT. I know I'll be sewing more from this pattern. Great instructions, very clear. Well drafted pattern, comes together beautifully! I have made up this pattern as the tunic top in some cotton lawn, and already have the dress version cut out too. It makes a perfect lightweight summer top. The only issue I had was with attaching the collar, which came out too big for the neckline. This was probably a user error while cutting however. Thank you for this great pattern! I really enjoyed making this pattern. The placket is quite simple and the directions are great so don't let that hold you back if the idea makes you nervous. I HIGHLY recommend avoiding stiffer fabrics with this pattern. 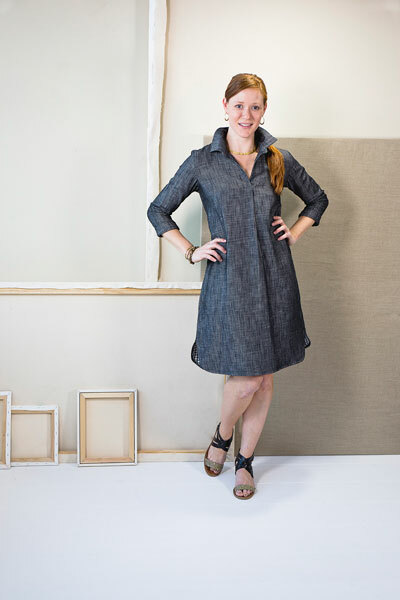 Some good quality chambray or linen work well (my dress is made from very soft dot chambray). If you are comfortable sewing lighter weight fabrics, get some nice voile or rayon challis. I am on the tall side and the dress is a great length for me. I will be making the tunic length top soon. I might also make another dress. . . . Discussion on the digital gallery tunic + dress sewing pattern from the Oliver + S Discussion Forums. 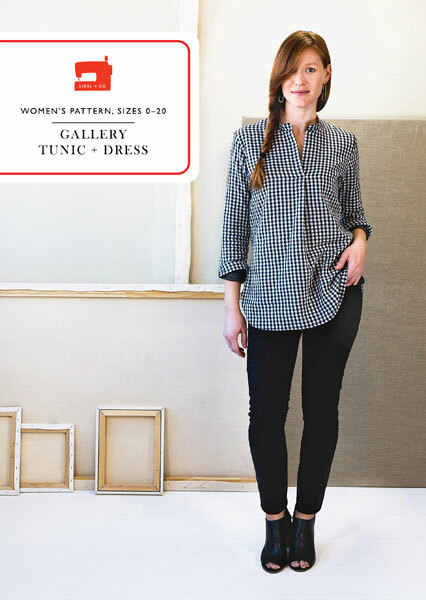 Find and share more photos on Instagram using the hashtags #gallerytunic and #lieslandco.